One of the ornamental vines that we considered planting to cover our blank wall is the Cypress Vine. Simply having just the Millionaires Vine up there sort of looks bland. Anyway, DH was able to get some seeds from a mature fruit on a robust plant that she saw near the kids' school. I've not personally seen this plant but DH says it has pretty tiny red flowers. Here's a pic from uniprot.org. Ipomoea quamoclit (Cardinal Creeper or Hummingbird Vine or Star Glory) is a species of morning glory native to tropical regions of the New World from northern South America north to Mexico. It is an annual or perennial herbaceous twining vine growing to 1-3 m tall. The leaves are 2-9 cm long, deeply lobed (nearly pinnate) with 9-19 lobes on each side of the leaf. The flowers are 3-4 cm long and 2 cm diameter, trumpet-shaped with five points, and can be red, pink or white; flowering is from early summer to late fall. It is widely cultivated as an ornamental plant throughout the tropics, and also outside of tropical regions, where it is grown as an annual plant only, not surviving temperate zone winters. In some tropical areas it has become naturalized. Seedlings must always be kept moist. They require full sun for good growth. This vine is one of the best plants for attracting hummingbirds, and is a vigorous grower. In warmer climates this plant can be extremely invasive. 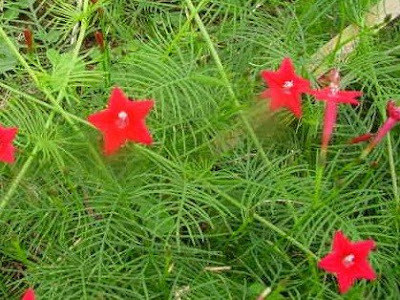 The "cypress vine" is a hybrid variety with Ipomoea quamoclit as one parent. It certainly LOOKS pretty. Even the leaves look nice. As I've not seen this plant nor its flowers, I'm taking DH's word for it. See how the Cypress vine's buds develop into flowers. Want more Cypress vine flowers? Here's how deadheading will yield more flowers. Spiff up your Christmas garden decor with Cypress vines.